The cerebellum is located behind the top part of the brain stem (where the spinal cord meets the brain) and is made of two hemispheres (halves). 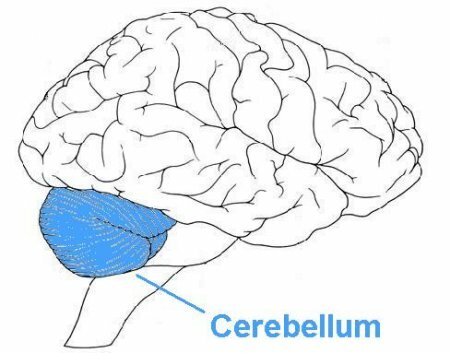 The cerebellum receives information from the sensory systems, the spinal cord, and other parts of the brain and then regulates motor movements. The cerebellum coordinates voluntary movements such as posture, balance, coordination, and speech, resulting in smooth and balanced muscular activity. It is also important for learning motor behaviors. It is a relatively small portion of the brain -- about ten percent of the total weight, but it contains roughly half of the brain's neurons, specialized cells that transmit information via electrical signals. The cerebellum is not unique to humans. Evolutionarily speaking, it is an older portion of the brain. It is present in animals that scientists believe existed before humans. Damage to the cerebellum, while not causing paralysis or intellectual impairment, might lead to a lack of balance, slower movements, and tremors (shaking). Complex physical tasks would become unsteady and halting.